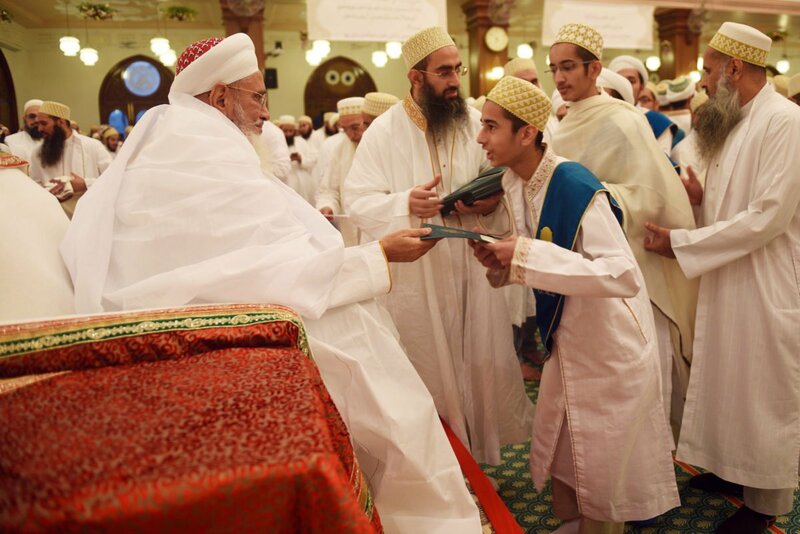 His Holiness awards a hāfiz with a certificate stating he has committed the entire Quran to memory. Alongside the examinations, the culmination of the academic year at Aljamea-tus-Saifiyah is known for the ceremony where new huffāz, individuals who have commited the entire Holy Quran to memory, are awarded their degrees after passing a series of oral and written tests. This year the award programme involved a procession where huffāz (sing. 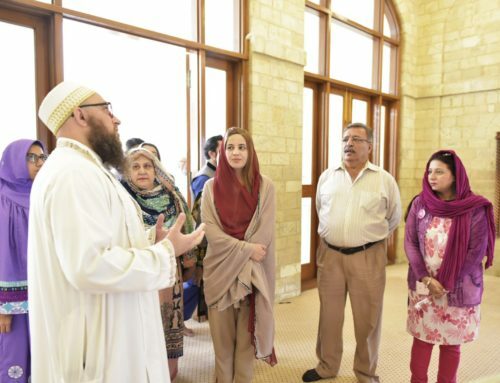 hāfiz) walked the main ceremonial avenue adjacent to Aljamea and collectively recited select verses from the Holy Quran before His Holiness and an audience of thousands of community members. A few huffāz were selected at random and asked to recite from various chapters or complete a pair or multiple similar verses in succession which are known as mutashābihāt. 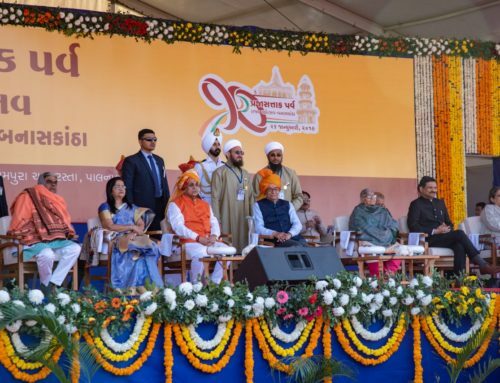 The programme took place on the eve of the 29th of Rajab al-Asab, Saturday April 13th in Surat. Those in other cities unable to travel participated via video-conferencing. This year’s event was all the more special as it celebrated the highest number of huffāz the community has seen in a single year. His Holiness had last year expressed the wish to see a great number of huffāz in the following year’s imtihān. 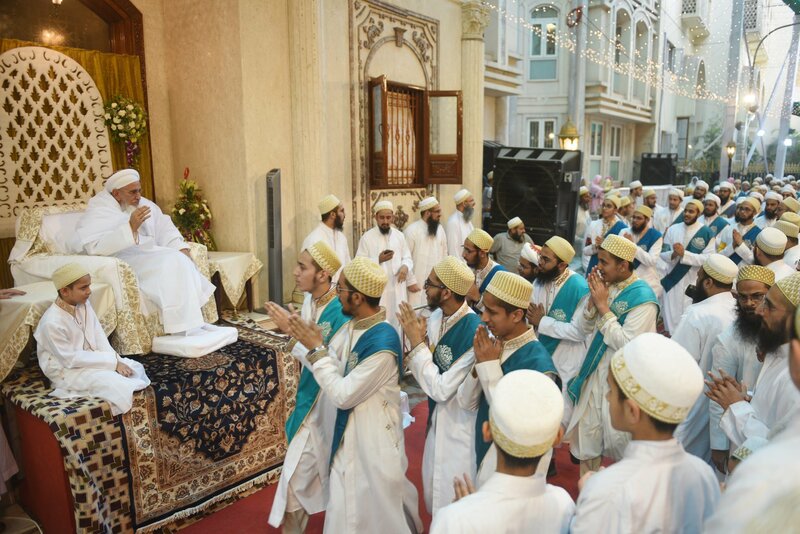 This year’s batch of huffāz is yet another milestone along the path to His Holiness’ ultimate aspiration for the community: that every household of the million-strong worldwide Dawoodi Bohra community have at least one hāfiz. A total of 876 individuals were presented with certificates for committing the Holy Quran in its entirety to memory. 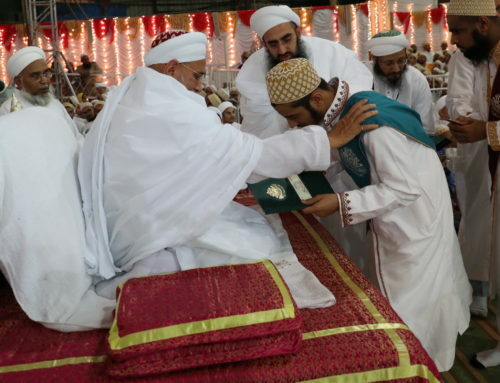 Although the movement to memorise the Quran Majeed began at Aljamea, it has spread across the community at large and over one-third of the awardees are from the general Dawoodi Bohra population. Of the huffāz, 115 were under the age of 13 and 29 were above 40 years of age. In this year’s batch, the oldest hāfiz was a 75 year old from Dubai and the youngest, a six years-old girl. Her grasp of the sacred text is so strong, she did not falter in a single question asked to her during her oral test. For students of Aljamea, the memorisation of the Holy Quran is not a process of rote learning. Muslims believe that the root of all knowledge lies in the Holy Quran and Fatimi theological and literary texts are replete with Quranic references. In some cases, especially esoteric texts, entire works are based on verse-by-verse exegesis of the Holy Quran. At Aljamea, the natural and social sciences too, are studied in light of the Holy Quran. Thus, committing the Quran Majeed to memory equips a student for education at Aljamea and further enhances his ability to contribute in academic and social arenas of society. Moreover, the feat of committing over 600 pages to heart increases confidence, and encourages a student to push his or her self further in the pursuit of knowledge. 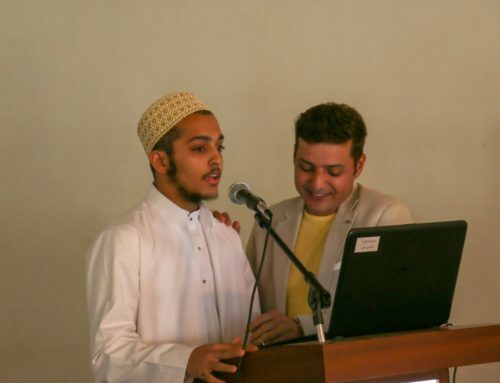 The award programme concluded with recitation by qurrāʾ (reciters of the Holy Quran) and mubtahilūn (sing., mubtahil: a specialist in recitation of devotional supplications). The highly distinguished reciters had flown in from Cairo and recited on multiple occasions during this year’s imtihān.